Don’t forget what you parents taught you .. you get what you pay for. Don’t be fooled by cheap knock-off’s or products that look similar, if you are looking for quality look no further. 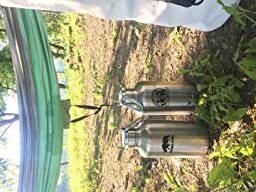 Smoky Mountain Growlers is a premium brand offering the ultimate in quality insulated stainless steel bottles and tumblers for the outdoor enthusiast and coffee courier. Extremely versatile, a Smoky Mountain Growler is an all-in-one beer growler, wine growler, stainless steel water bottle, travel tumbler, coffee canteen, soup thermos, and more. 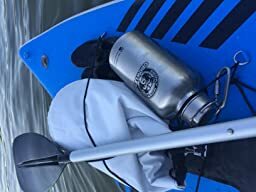 Highly durable, the growler is built to withstand extreme conditions and even floats, making it the preferred canteen for enjoying on a boat, raft, kayak, or canoe and ideal for camping, hiking, backpacking, or any outdoor adventure. It’s stylish and lightweight enough for everyday uses, like taking it to your local craft brewery. Stainless steels unique surface has no pores or cracks to harbor dirt, grime or bacteria. It is corrosion resistant, non-leaching and safe! You can switch between water, juice or milk and there will be no taste or smell of any of them after the bottle has been washed! BPA and Toxin FREE, they are made from 18/8 Food Grade Stainless Steel and are 100% Recyclable making them eco-friendly. They keep your beverages Fresh and Cold for up to 24 hours and Hot for up to 12 hours without priming – when primed HOT up to 24 hrs and COLD up to 3 DAYS, Iced up to Days! They are one of the few growlers with a HIGH rating for keeping carbonated liquids fresh. In fact, independent tests and magazines like Craft Beer and Brewing Magazine (Feb/March 2017) have rated us higher than some of our competitors out there like Hydro Flask, Kleen Kanteen, Thermos, and Yeti when it comes to keeping your beer fresh. Extreme Temperature Control COLD 72 hrs ICE 5 Days or HOT to 24 hrs *Ditch the ice chest & mess and grab some Smoky Mountain Growlers! I think the Smokey Mountain Growler is the best growler you can buy for the money. It is made out of stainless steel so it won’t break if you drop it and they designed it so plastic won’t come into contact with whatever you choose to fill it with. The large mouth opening will allow for ice cubes too. It is insulated so the contents will maintain temperature for a reasonable amount of time. Cold beer is the only thing I have kept in my growler and it serves that purpose very well. Someone mentioned that it made their water taste metallic but I have not noticed any kind of nuance imparted to my beer in regard to keeping my beer in a Smokey Mountain Growler. 18/8 stainless steel is about as inert as it gets, unless you go with glass or titanium. I think I may have to buy another one. I’ve had Kleen Kanteens and HydroFlasks, this is the best fusion of both. My complaint with Kleen Kanteen is that the insulated versions don’t have wide mouths. I like wide mouths for adding protein powder for snacks/meals throughout the day and for the ease of cleaning. My complaints with the wide mouth insulated HydroFlask is the cheaper plastic screw lid. I never felt confident with the HydroFlask lid because it had plastic threads to screw down with. It was possible to cross-thread them, which would either lead to leaks or destroying the threads if you screwed too hard. Additionally, the HydroFlask has a weird rubber gasket around the outside of the lid which I think is supposed give you a better grip to unscrew, but was mostly just hard to clean underneath, leading to lid smelling funny. The plastic HydroFlask lid also was plastic on the inside which would come into contact with whatever you had in the bottle. I try to minimize the amount of plastic that comes into contact with my food, especially hot food, like the pot of coffee I pour into this in the morning. I have dropped this bottle numerous times, through no fault but my own, and it has come through with a few dents and scratches but no noticeable impairment to function. I start every morning pouring my pot of coffee into this, move onto water, mix protein powder in for lunch, then more water until heading home for dinner. It keeps hot things hot and cold things cold. I have not used it as a growler for beer, but imagine it would serve that function fine. When I open it for the first time after adding ice cubes to my hot coffee, I can hear the negative pressure differential within the bottle from gas above the coffee cooling from the ice. However, be aware that it does not have the bottle markings that some states require to fill. I purchased this bottle for outdoor excursions to keep drinks cold (can’t add anything to the discussion about keeping liquids warm). I have used it about 10 times now, filling it 1/4 to 1/2 of the way with ice and the rest with cold tap water. After about two hours there is no ice remaining, but the water is still cold. I use an aluminum carbiner to clip the bottle to deck rigging on my board where it sits for around four hours in direct sun (which should not matter substantially due to vacuum insulation everywhere except points on the lid). By the six hour mark after filling, the water is lukewarm. The bottle did arrive with a small/shallow dent, though I wasn’t bothered by this as it seemed purely cosmetic. This could account for the issues with thermal isolation, but I’m not certain. I purchased another brand of bottle for comparison that my boyfriend uses and they function identically and have identical manufacturer markings–the only differences are the graphics on the bottle. Overall the bottle does a decent job, I just wish the problem of heat energy transfer could be solved so that ice would remain for at least three or four hours so the water would be icy cold when are needing it. Next time I intend to fill the bottle 3/4 with ice. I also have a 25 ounce stainless steel bottle by Rehydrate Pro that I use daily (as opposed to only on trips like this 64 ounce size) and it keeps ice for over 24 hours.